Samsung never stops. Being worldwide leader in smartphone industry and aggressive manufacturer of phones, Samsung has launched two new android phones – Samsung Galaxy Star and Samsung Galaxy Pocket Neo. 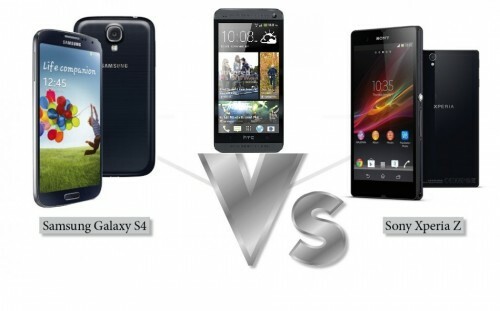 Both these phones fall under cheap and affordable smartphones category targeting youth mobile users. They come with dual-sim connectivity with dual sim always on feature supporting dual standby and auto-call forwarding if one sim card is busy on call. 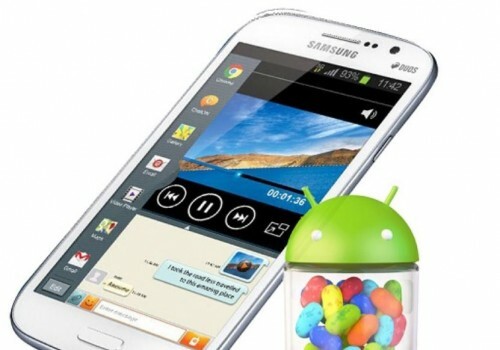 They also feature the latest Android 4.1 Jelly Bean OS with Touchwhiz UI on top of it to provide rich user experience. The user experience has been optimized for dual-sim features supporting Quick Panel and widgets for easy switching of SIM cards from Homescreen. Furthermore, these are two different buttons on UI wherever required for calling or sending message with desired sim card. Both these phones have small curved design and they’ve almost similar physical dimension and weight. Galaxy Star has 3-inch display. On this small display, the screen has qvga resolution of 320*240 pixels. On the inside, it contains 1GHz processor and 512mb RAM. The internal storage capacity is limited to 4GB. It also supports external memory card of upto 32GB. There is no front camera. 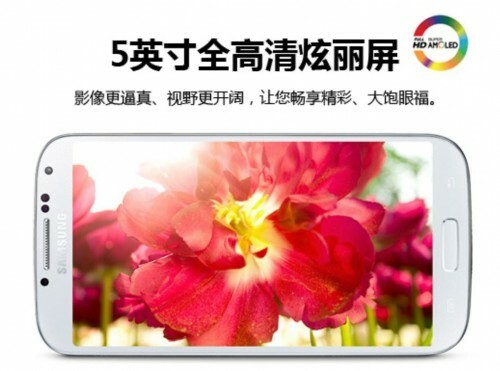 2 megapixel rear camera is there without flash. It measures 104.95 x 58 x 11.9 mm and weighs 100.5 gram. 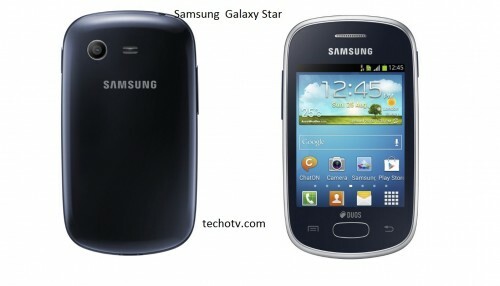 On the connectivity side, WiFi, bluetooth 4.0 are present, but Galaxy Star doesn’t support 3G. It supports 2G, GPRS, EDGE connectivity only. It has 1200mAh rechargeable battery inside. Galaxy Pocket Neo is almost similar to Galaxy Star android phone with dual sim capabilities, same size display and screen resolution, WiFi, Bluetooth, same battery capacity, 2mp camera, no front camera. 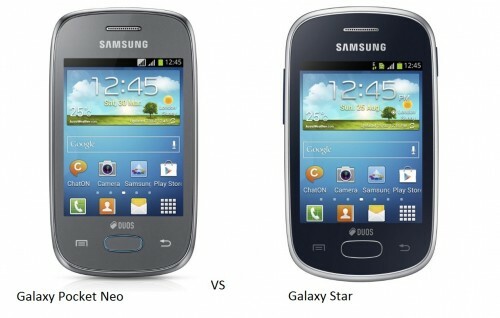 Galaxy Pocket Neo differs from Galaxy star in terms of network connecitivity as Pocket Neo supports 3G network also. It has A-GPS+GLONASS, which is not present in Galaxy Star. 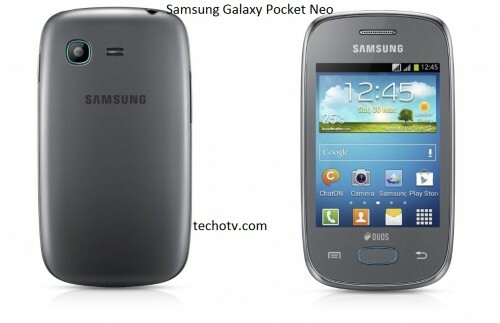 The processor in Galaxy Pocket Neo is of 850MHz only while the RAM is of 512mb. It’s surprising as from the specifications, Galaxy Pocket Neo seems to be better than Galaxy Star, but the processor in Neo is of lower speed than that of Star’s. It has internal memory of 4GB with support for external memory card. The physical dimension is 105 x 57.8 x 11.8 mm and weight is 100.5 gram. Intelligent Motion UI (Flip to mute, Shake to update) feature. Dual SIM management settings, options and Widgets for easy switching. Both the phones are expected to be shortly available in market. Pricing details have not been announced, but we hope that Samsung set prices competitively as several other cheap android smartphones are already abundantly available in the market and these phones add to the ever-growing crowd.